Finding your way through traffic has never been easier. Both Android Auto and Apple CarPlay now work on many makes and models of cars, and the in-car nav system on even the lowest priced vehicles tends to work reliably well. 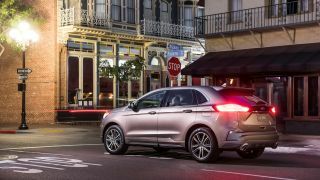 Yet, in a test of the Waze app in the 2019 Ford Edge, it became obvious that a few extra perks in the app make GPSing even easier. I tested Waze on an iPhone X (you need to connect up with a lightning cable), which activated Apple CarPlay. As long as you have Waze installed on your phone, it appears in the dashboard display. Waze, which is now owned by Google, has been around for almost a decade, although it really came into the forefront only in the last five or six years. One of the key differentiators is that users can crowd-source GPS information like traffic accidents and speed traps. The fact that Waze has been around for a while is important. When any app relies on the information from other drivers, it needs a good market share. The more users the better. In my test, Waze popped up right away and has a bright and colorful (if slightly cartoon-look) appearance. You can easily identify where you are on the map, the roadways around you, and any points of interest like gas stations and restaurants. So far, that part of the app is not that different from the one included with many cars. Ford does a good job with navigation on its own, so I was a bit incredulous about whether Waze would help that much. I also tend to prefer a more detailed map. On an 2018 Audi Allroad test not long ago, i remember activating the Google Earth view for navigation and seeing details like lakes and rivers that helped me choose a more scenic route. Waze is not designed for that level of photo-realism, but the main advantage for me had to do with the alerts. Having Waze running up on the main screen -- something I have not tested before -- helps because you can see any of the accidents, speed traps, or other problems right in the main display. During my test, I heard one strange chirping sound that indicated a speed trap. You can also select an option to alert other drivers about issues. For whatever reason, the CarPlay link only shows traffic, police, crash, and hazards you can identify for other drivers, even though the app itself has a few other options available (including road closures and speed cameras). It’s likely because Waze and Apple don’t want you do be too distracted. Of course, there are a few other perks as well. On one drive to a movie theater, I noticed another driver had flagged an icy road hazard. I pulled over and parked, and used my phone to type a public message asking how bad it was. I didn’t hear back, and it would have been nice to be able to do this task while driving using Siri or Waze. In Apple CarPlay, I didn’t see a way to post a public message or even to get more info about the hazard. The only way I could see more detail was to create a route, then click the hazard icon on my phone. Waze provides some nice integration with Spotify as well, which does work through Apple CarPlay. From within Waze, I was able to select a playlist and skip tracks. Overall, Waze just worked better at directing me to my destination, providing alerts about speed traps and hazards along the way. It’s hard to improve on the basic navigation provided with Apple Maps and the Ford Edge nav that’s included (mostly because the main purpose of these apps is to give you clear directions), but Waze did make the journey easier.